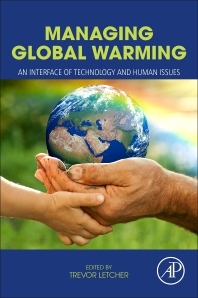 Managing Global Warming: An Interface of Technology and Human Issues discusses the causes of global warming, the options available to solve global warming problems, and how each option can be realistically implemented. It is the first book based on scientific content that presents an overall reference on both global warming and its solutions in one volume. Containing authoritative chapters written by scientists and engineers working in the field, each chapter includes the very latest research and references on the potential impact of wind, solar, hydro, geo-engineering and other energy technologies on climate change. With this wide ranging set of topics and solutions, engineers, professors, leaders and policymakers will find this to be a valuable handbook for their research and work. 1. Why do we have global warming? 3. The Present Status of Electricity Generation in the World; how important it is, which industrial methods of electricity generation world uses, how efficient they are, how they interact in an electrical grid. 6. Nuclear Fusion: what of the Future?